Are You Ready for International Talk Like a Pirate Day? 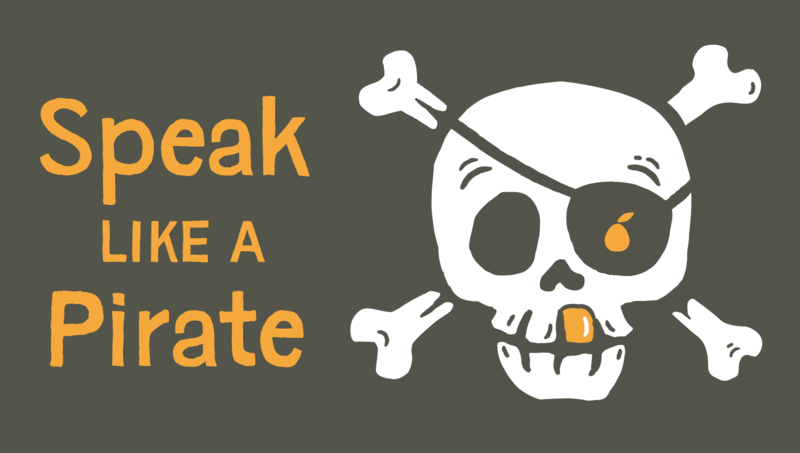 Blow me down and brush me barnacles — International Talk Like a Pirate Day is September 19! Make no bones about it — celebrating this holiday is fun for landlubbers and pirates alike. Ahoy language lubbers! Don’t be a scallywag — join in the fun with costumes, games, and, of course, lots of pirate speak. If yar havin' a bit o' trouble growing some whiskers, try pilfering yar closet for the following items to create the essential pirate look. Got a hole in ye pockets? All ye need is a newspaper to craft this pirate hat. Decorate it as ye desire. No need to be a tailor to craft a shirt fit for a pirate with this tutorial. All ye need is one white and one old brown T-shirt and a pair o' shears (scissors, that is), which you'll use to rough up ye shirt and to snip the holes for the ties. We won’t ask how ye lost yar eyeball, but cover up the damage done with this easy eye patch. If ye got some doubloons left, check ye local party store, costume shop, or if yer lucky, ye might just score one at the dollar store. To make yer own, snag some aluminum foil, a disposable plastic cup, scissors, and black duct tape — but that last one ain’t essential. No pirate look is complete without a bit of bling. Wear your favorite gold hoops or clip on a dangly earring (we won't ask where you got it). Watch the tutorial below to see how one of our Mangos made her own pirate swag. Last year, Long John Silver's official Facebook gave customers an opportunity to win a $25 gift card if they shared their favorite pirate joke or phrase. So, keep at least one eye un-patched so you don't miss any deals this Pirate Day. No Pirate Day is complete without a proper hunt for hidden treasure. Just add yar own pirate twist to a scavenger hunt with swashbuckling riddles and (plastic or chocolate) gold coins for winners' booty. Remember, 'X' marks the secret spot! Use two parallel lines of duct tape to create a 'plank.' Blindfold young scallywags and have them walk the plank by staying in between the lines. Another option is to use an actual plank of wood laid on top of a blue tarp. Reward the brave ones with a bag o' chocolate dubloons. All hands hoay! Adventure into the great unknown with a Spanish galleon. All you need are a few cardboard boxes and some creativity. Check out a few ships for inspiration. Then, place your galleon on top of some blue tarp for even the youngest pirates to start sailing the seven seas. If ye have worked up a sweat with all yar carousin', you'll be ready for a cup o' grog, a.k.a. pirate punch. While the real deal features a strong spiced rum, you can make a kid-friendly pirate punch with any combination of tropical juices and a bit of 7-Up for some fizzy fun. We found one blogger who makes a mean grog recipe with Berry Blue Typhoon Hawaiian Punch, 7-Up, and eight scoops of pineapple sherbert. Don’t just look like a pirate — talk like one, too. With Mango’s Pirate language course, you'll learn everything you need to know to talk in perfect Pirate. Create a profile with Mango to start learning Pirate for free! Log into yarr Facebook profile and navigate to the dropdown menu on the righthand side to select the 'Settings' tab. Then, click the 'Language' tab to change the language you want to use Facebook in to Pirate. You can even choose to translate your newsfeed stories into Pirate as well. Savvy? Pass the time at sea with some shanties (work songs with rhythms) that coordinated the labor of sailors and pirates alike. Steer clear of Davy Jones's Locker, and share in the fun of Pirate language learning at your library. Fancy you’re ready? Well then, batten down the hatches and weigh anchor to embark on a language-learning adventure! How are you planning to celebrate Talk Like a Pirate Day? Practice your Pirate prose in the comments below!